A small picturesque town on the east coast of Great Britain that is famous not least for being the place where Dracula landed in England in Bram Stoker's world-famous novel. I admit, it's possibly the thinnest connection to anything dark, and only fictional, but too cool to exclude. And I simply like Whitby – so any excuse, really. But seriously, Whitby plays the dark card quite well. There are guided walks of the spots featured in Bram Stoker's "Dracula", there's a (rather tacky) "Dracula Experience". The latter "retells" the story with music, dummies, "special effects" and sometimes live actors (open daily in summer 9:45 a.m. to 5 p.m., only at weekends in winter; admission: 3 GBP for adults, 2.50 GBP for children (13 and under) and 9 GBP for a family of four). 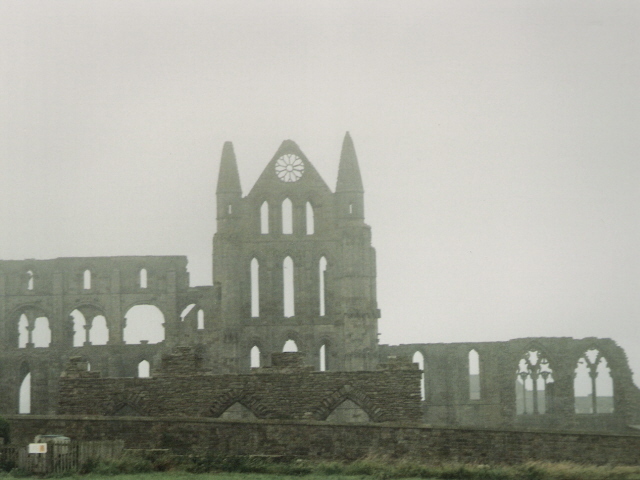 Moreover, a major gothic festival takes place in Whitby twice annually. Even some of the places offering accommodation in Whitby have latched onto the gothic/dark theme. So fond has Whitby become of its dark clientele! Brilliant! Just the sheer look of the place makes it understandable why Stoker derived some inspiration from it. 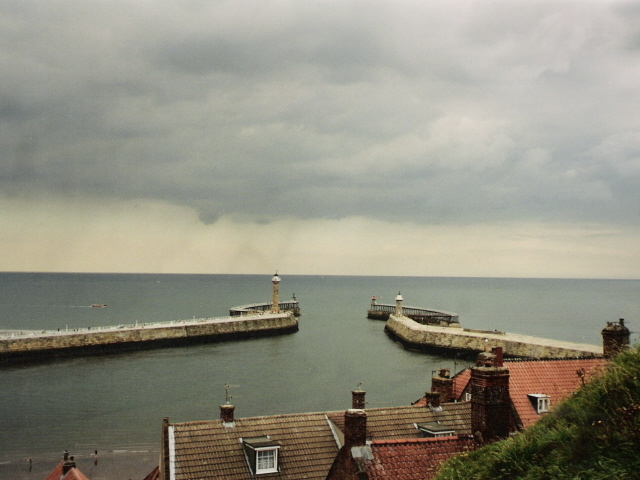 Most of the town is on the West side of the harbour – thus looking onto the dramatic East cliff. On top of this cliff is the ruined Whitby Abbey, a structure so gothic you could even mistake it for a horror film set. Closer to the cliff face still is the smaller parish church of St Mary's with its atmospheric graveyard (where some crucial scenes in "Dracula" take place). Sea winds have erased most of the writing from many tombstones, so they look more like sandblasted sculptures. To get to the top of East Cliff, you have to negotiate 199 steps. But the reward is worth it. 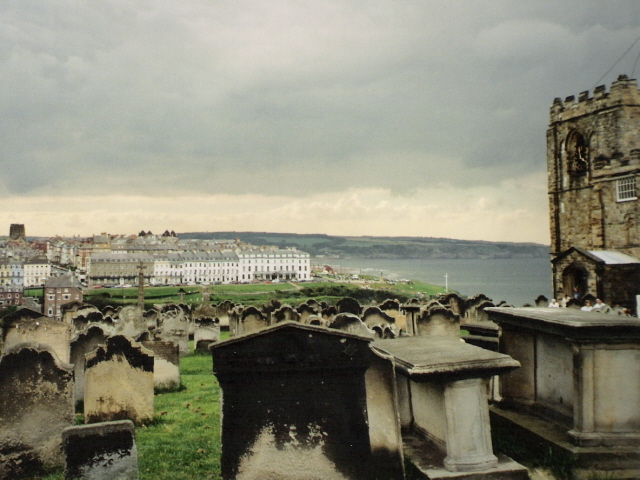 Even without all the looks and literary associations, Whitby had some real dark history, esp. through its marine history – off its coast real life drama has taken place in the form of shipwrecks and attacks. The local Lifeboat Museum gives an account of such stories. The gothic festival also made a connection with real-life tragedy when in 2007 they dedicated the event to, and successfully raised funds for a Whitby memorial (on West Cliff), to goth girl Sophie Lancaster who had been brutally murdered earlier that year in Bacup (by a bunch of mindless teenage monsters on a spree of "feral thuggery" – to quote the judge in the subsequent trial … for once, at least the main perpetrators did not get away with it but received relatively long prison sentences). Location: on the North Yorkshire coast, Great Britain – some 30 miles east of Middlesborough and 20 miles north of Scarborough.